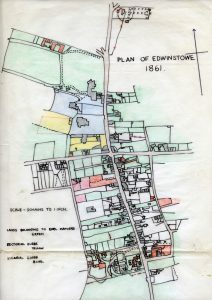 Edwinstowe was divided into two portions. The higher village, Edwinstowe ‘on the Hill’ and the Lower village by the River Maun, Edwinstowe ‘by the Water’. 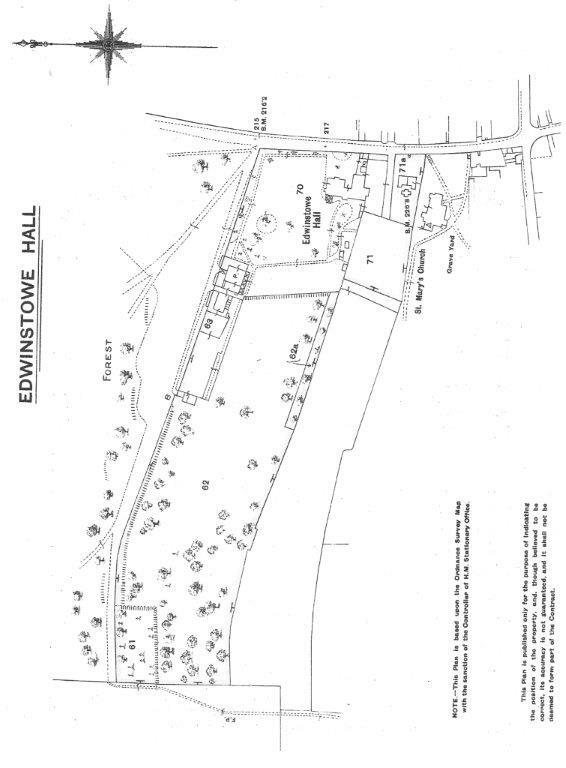 In 1327, William, son of Ralph-of-the-Hill of Edenstowe is said to have resided where the hall now stands. In 1332, there were 27 families listed in the village. 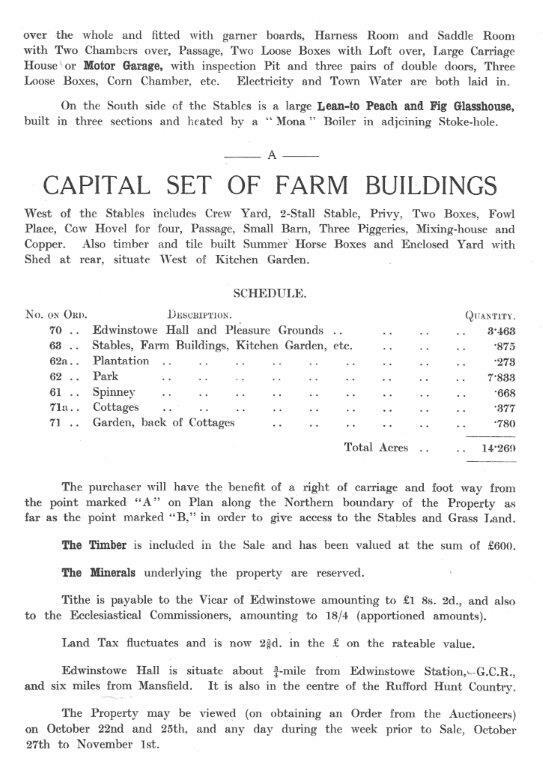 Some following eviction from Rufford and Cratley by Rufford Abbey who sought to increase pasture for sheep due to the pre-­‐Black Death growing wool trade. This early map, dated 1638, shows no hall but the size of the village and the position of the church. The inclosure (Free Land) identifies Mediaeval three-field system. The Hall was built about 1702 on land owned by the Duke of Newcastle. The stables and out-buildings were built after 1740. 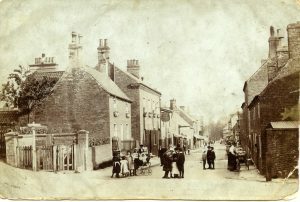 The village had grown significantly over the previous 100 years. 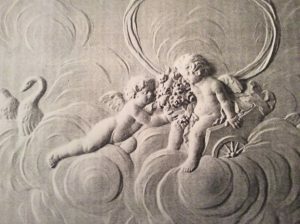 The hall was modernised in the 1750s and Pevsner scholar of the history of art dated the drawing room ceiling to 1751. The ceiling today, is beautifully preserved and the detail is crisp and clear. 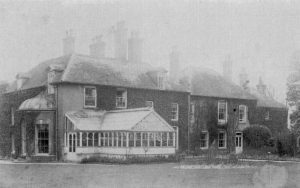 The Hall, in 1770, like many other buildings in the area, would have to have paid Window Tax. Some houses in the village blocked up windows to save money. 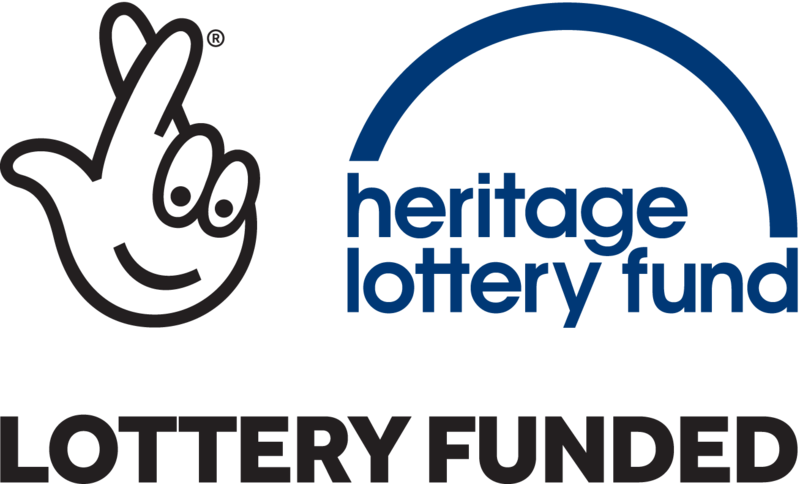 Documents show that the owners of the Hall did not pay the tax, possibly as it was a rented property. At this time a new saying was coined, ‘Daylight Robbery’. 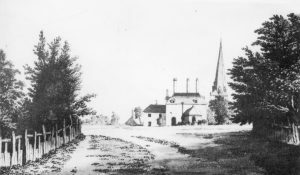 By the early 1800s the Hall had increased its lands to include most of the Free Land. Wings to the main house and outbuildings had also been added. The Scarboroughs had occupied the building since the mid 18th century. In the mid 1800s, the Rev. Lumley (Earl of Scarborough) lived at the hall, leased from the Duke of Portland of Welbeck Abbey. After this, it passed into the hands of Earl Manvers of Ollerton Hall. Lumley then became 7th Duke of Scarborough, later, he inherited Rufford Abbey but never lived there. 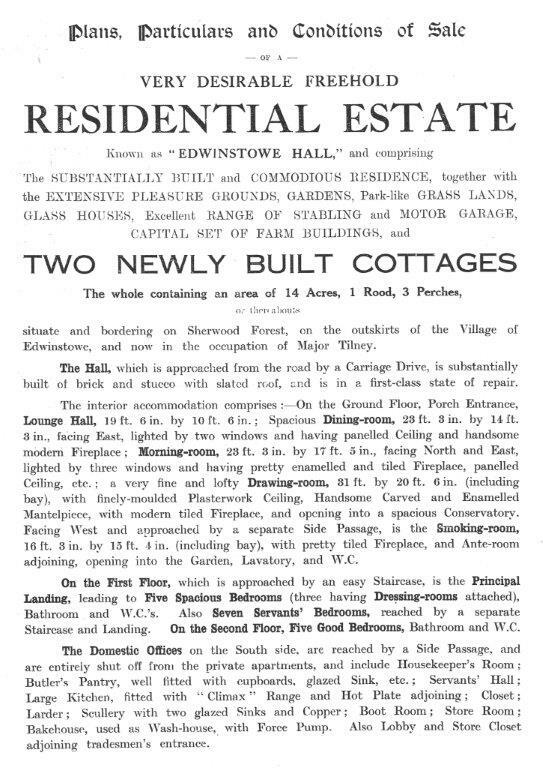 The Hall is listed at that time as having ‘pleasure gardens, stables and a kitchen garden’. Then over the years it was let to various gentlemen. 1862 R. H. Walpole . Reported in the ‘Mansfield Reporter’ an alleged robbery at the hall. The butler and gardener were brought before Magistrates. 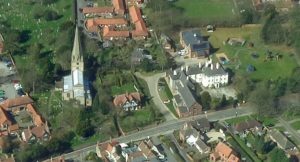 This case had excited considerable interest in the neighbourhood of Edwinstowe & Worksop and was heard yesterday at Worksop Police Court . Allegedly a quantity of silver was stolen by a notorious gang of burglars. 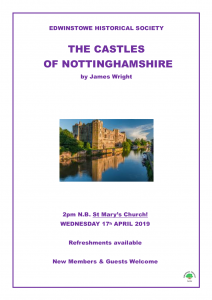 At Newark & Retford Quarter Sessions. Actually, Thomas & Meadows were on bail for stealing 4 shirts, 37 collars, 2 pairs of socks, 22 lbs of candles, 14 lbs. of soap, 4 bottles of blacking – goods of James Alexander. Mr. Appleton prosecuted & Mr. H. Y. Stanger defended. Mr. Stanger stated that there might have been irregularity in these proceedings, but there was no felonious intent. 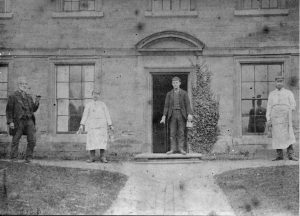 Late 1800s Servants at Edwinstowe Hall. Were these the men who were wrongly accused? James died in 1891 aged 45 in the Bahamas. 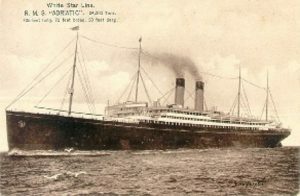 His body travelled on the White Star Line Adriatic. A luxury floating hotel. 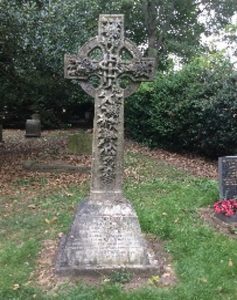 Grave of James Fane Alexander & his wife Aurea Otway Mayne. This window was placed here by Aurea – 23rd June, 1869. 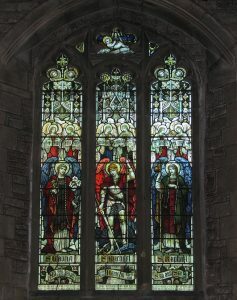 Subject – Archangels: St. Michael, St Gabriel and St. Raphael (Health & Healing & travel) Created by the glass works – Whitefriars, James Powell & Sons of London. In memory of Capt. James Fane Alexander of the 17thLancers. 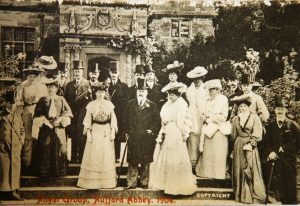 A party from Edwinstowe Hall were guests when the Prince and Princess of Wales visited Welbeck Abbey in 1896. Mrs. Alexander wore white satin with triple frilled sleeves of deep crimson, a tiara of diamonds and carried a magnificent bouquet of scarlet blossoms. In 1897, she married Major Ralph Henry Fenwick Lombe. 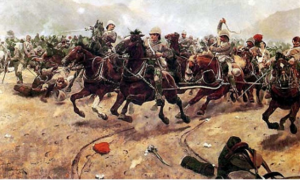 The Lombes rode to hounds and entered horses in equestrian events. 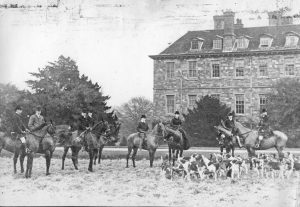 He became a Justice of the Peace until he moved in 1911, to Grafton Manor, Northants. 1901 Census, Mrs. Aurea Lombe (formerly Alexander) had her late husband’s mother, Mrs. Julia Alexander living with her. She gave Aurea an embroidered fire-screen as a wedding present in April 1899. 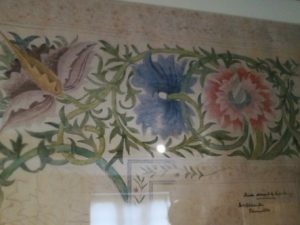 Designed by William Morris. 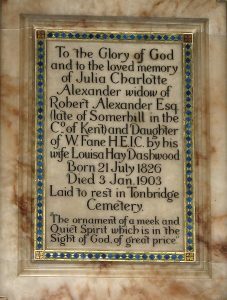 Memorial to Julia Charlotte Alexander in St. Mary’s church. 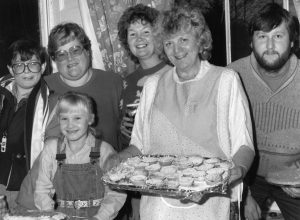 After her death she left the sum of £58,000. In 1899, the Sheffield Daily Telegraph reported an accident involving Aurea who was driving her pony & trap down High Street. She was not seriously hurt. 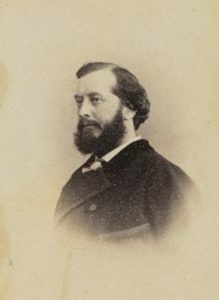 This is Cecil Francis Alexander a relative born in 1848 – Died 1895. She was married to the Bishop of Derry. A window to her memory is in Derry Cathedral, also made by Powell of Whitefriars Glass in the same Gothic style as the Archangels window. 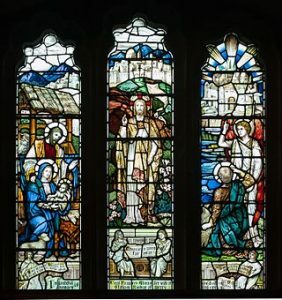 This window commemorates the hymns she wrote. This included: Away in a Manger, There is a Green Hill Far Away, All Things Bright and Beautiful, Once in Royal David’s City. 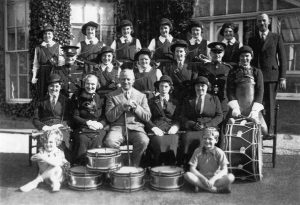 Edwinstowe Hall hosted many ‘Horticultural Shows’. They were judged by the Head Gardeners of Edwinstowe House and the Hall. In 1894, it included flowers, produce, foals and athletic sports. It gives us a glimpse of life in 1895. 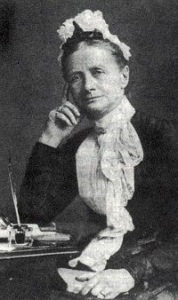 A newspaper advertisement by Mrs. Fane Alexander ‘recommended’ a plain gardener, praising his skill for growing peaches, grapes, and understanding pigs and stock. E. Meadows was head gardener. Was this righting an injustice? 5 years later and there are new greenhouses. 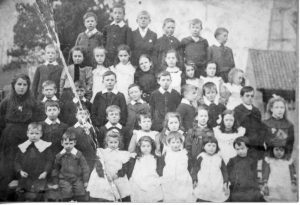 One of these school children was Winifred Meadows (reference school log book) she was daughter of the Gardener, Meadows, from Edwinstowe Hall. A very different looking photo from a few years later in 1911. 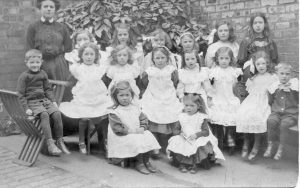 Birthday party of Edith Cole nee Woodhead – Front Right. Another glimpse of life at that time. 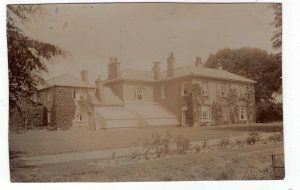 In 1912, following her marriage to Mr. Lombe, Aurea moved to Grafton Manor. After her death a large portion of her estate, £29,363, was bequeathed to her servants. 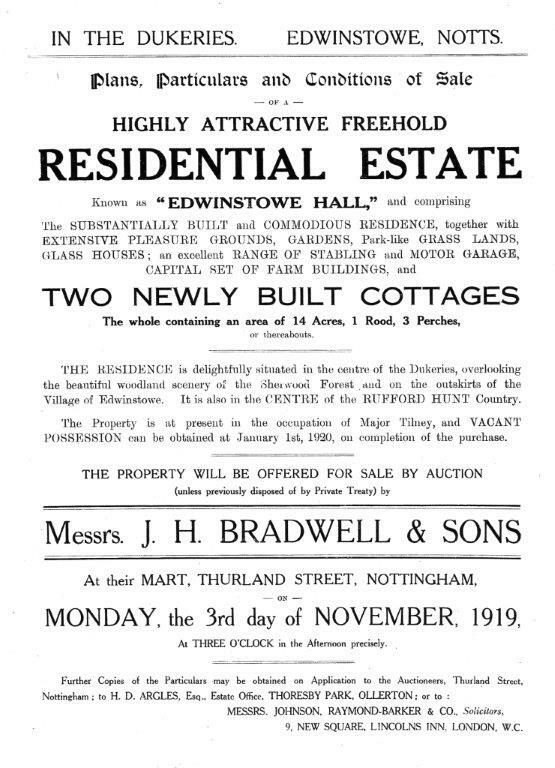 It was during this time ,1912, that Major Howard Tilney moved in. His rent was £227.20s p.a. He left in 1919. 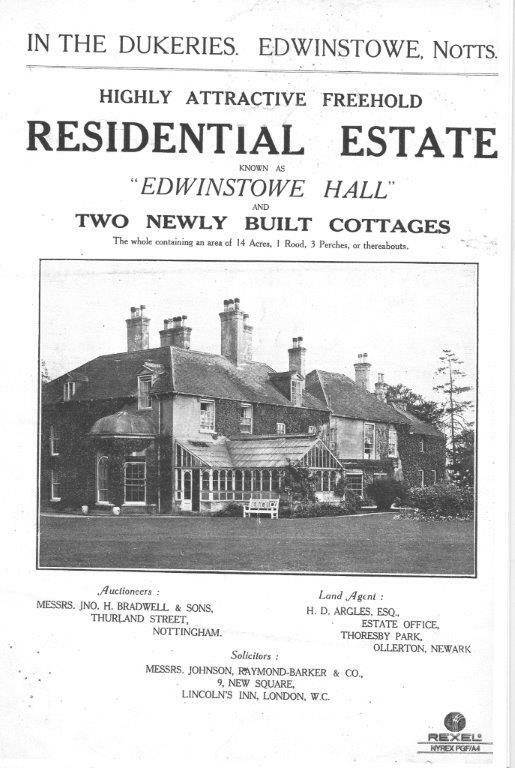 Edwinstowe Hall in 1923 A Welfare Centre. 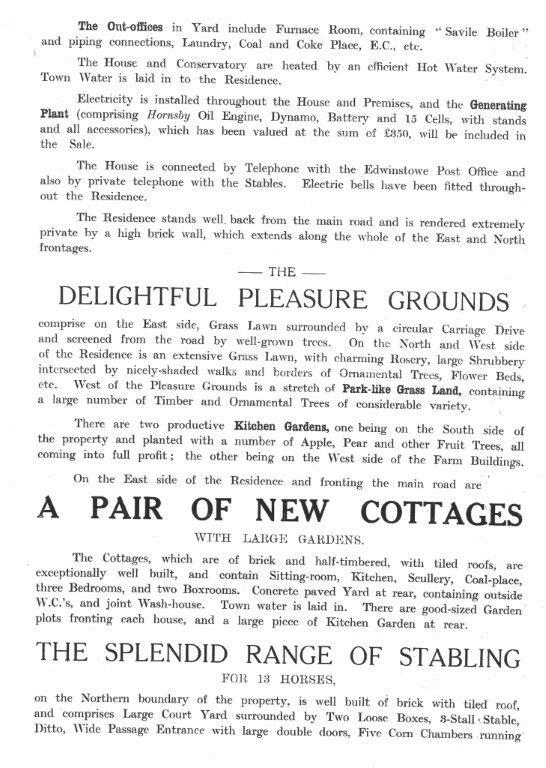 In a newspaper advertisement announcing the sale of Edwinstowe Hall by Lord Manvers in November, 1919, the hall was accurately described as a substantially built and commodious residence with extensive pleasure grounds, gardens and park-like grasslands, glasshouses and an excellent range of stables and motor-garages. 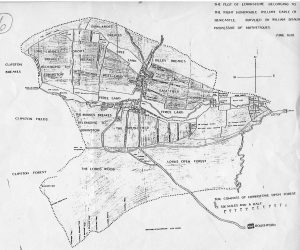 Clearly impressive, the Bolsover Colliery Company who were planning to sink a new mine on the outskirts of the village, acquired the hall and grounds from the 1st January, 1920, and, over a period of 3½ years, converted it into a Welfare Centre for the use of the various organisations which the company set up for its employees. 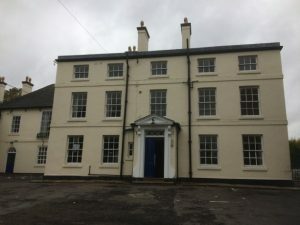 The Welfare Centre was opened in August, 1923, by the Duke of Portland who, in a formal ceremony, used a gold key to enter the refurbished hall, and then walked over to the dormitories which he opened with the same key. 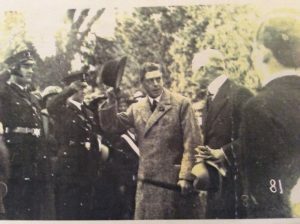 In the same year the Prince of Wales (later King) visited the Hall 1923. Back row: ? ? 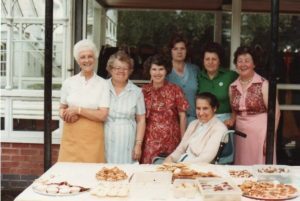 Margaret Tagg, Margery Halfpenny, Gwen Freeman, ? Front row:Gwen Richardson, Mrs. & Mr. TEB Young, ? ? 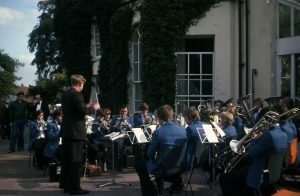 Companies of boys’ and girls’ brigades and ambulance divisions marched past a ceremonial platform, accompanied by massed brass bands and the Duke made a speech to the assembled throng. Tea was provided in the hall, in the dining rooms of the dormitories and in marquees. 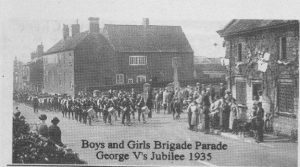 The photograph is of a similar parade of the representatives of six colliery villages en route to Edwinstowe Hall on the occasion of George V’s Jubilee celebrations in 1935. 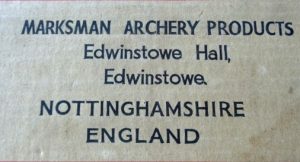 In the 1960s, the property was owned by Mr. Les Howis, an archery manufacturer. He later moved to the Harley Gallery, Welbeck. 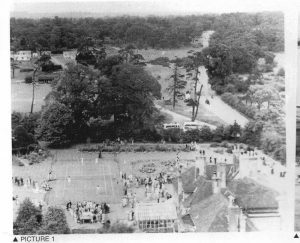 Later still, under the ownership of Nottinghamshire County Council, it became a Children’s Respite Centre. We have all been round the mulberry bush, in imaginative play while singing the traditional nursery rhyme “On a Cold and Frosty Morning”. Did you know, however, that the rhyme has its origin in the exercise yard of Wakefield Jail, where the prisoners walked around the mulberry tree planted in the middle? 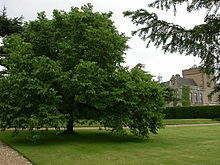 There was a listed mulberry tree in the spacious grounds of Edwinstowe Hall and, like several other trees in the gardens, it was reputed to be over 200 years old. There are twelve species of mulberry trees, all of which are becoming increasingly rare in Britain with the disappearance of many large old gardens. The black mulberry (Morus Nigra) is the species most commonly cultivated for its fruit which is similar in shape to a blackberry and can be eaten raw. The leaves of the white mulberry are the food for silkworms. Edwinstowe Hall’s tree was a black mulberry with a rough-scaled trunk and heart shaped, toothed leaves. The tree, sadly, died many years ago.